Leor Halevi, a historian of Islam, explores the interrelationship between religious laws and social practices in various contexts. He is the author of Muhammad’s Grave: Death Rites and the Making of Islamic Society (Columbia University Press, 2007). This book won the Ralph Waldo Emerson Award, given by Phi Beta Kappa for a notable scholarly contribution to the understanding of the cultural and intellectual condition of humanity; the Albert Hourani Award, given by the Middle East Studies Association for the year’s best book in the field; the Medieval Academy of America’s John Nicholas Brown Prize; and the American Academy of Religion’s Award for Excellence in the Category of Analytical-Descriptive Studies. Professor Halevi is currently at work on a new book that will examine Muslim attitudes toward foreign goods and world trade, focusing on the tension in Islamic law between an economic interest in trade and a religious interest in social exclusivity. Theological concerns about ritual obligations—and in particular prayer rites—will feature prominently as a theme in this book. 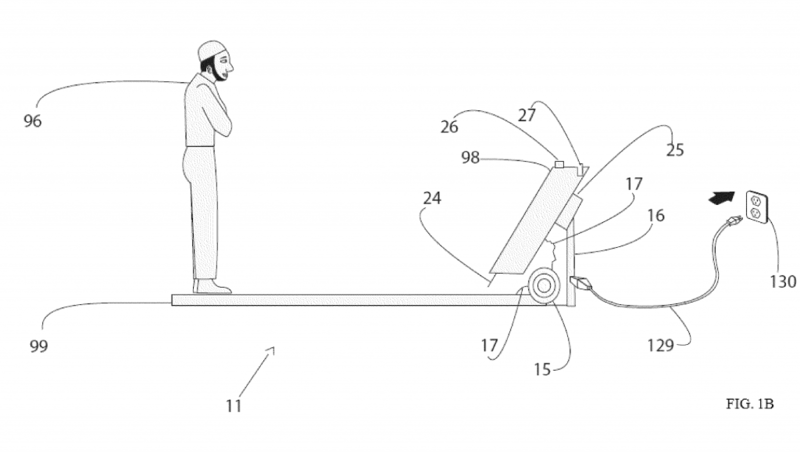 A machine that I’ve taken to calling “Pray Pray Revolution” stands out, among hundreds of other prayer systems and devices described in patent applications, due to its inventor’s precisian approach to ritual movement. In 2009 Wael Abouelsaadat, a graduate student in Computer Science at the University of Toronto, filed an application for an interactive prayer system with the U.S. Patent and Trademark Office. His system for “enhancing prayer” has three key components. First, it has a prayer rug equipped with force sensors and vibrating motors. This pressure-sensitive pad registers when and in precisely what order a user’s knees, hands and forehead touch the ground. Second, the system comes equipped with a camera that takes digital photographs of the user in motion. Through a posture detection technique involving the use of geometric modeling tools, a software program establishes a kinematic model of his or her bodily poses. Finally, this system also features a screen that coordinates the display of scriptural passages—in the original script of revelation or liturgy, as well as in transliteration and translation—with the performance of particular gestures of prayer. In my book, I will analyze the effects of novel technology on the practice, as well as the perception, of prayer rites by Sunni reformers who invariably assess modern things on the basis of scriptural precedents. To understand these effects, I will research fatwas, authoritative juridical opinions, concerning a wide range of new machines: gramophones, airplanes, slaughtering machines, digital devices, and many other objects.